Are you dealing with a pain in your shoulder during the day and at night? Are you noticing stiffness and decreased motion in your shoulder, making it difficult to perform your daily tasks? 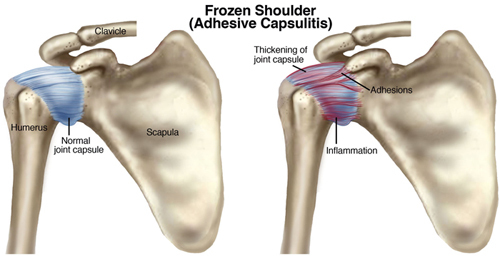 There is a chance you may have Adhesive Capsulitis, also known as Frozen Shoulder. Adhesive capsulitis commonly affects women more than men and it usually occurs between the ages of 40-70 years old. There is no known cause why people develop frozen shoulder, but studies show that those with diabetes, stroke, or Parkinson’s may be at a higher risk. It also tends to develop in those that have had an injury to the shoulder, or during periods of immobilization. The shoulder is a ball-and-socket joint. It is made up of three bones, the humerus, scapula (shoulder), and clavicle (collar bone). The head (top) of the humerus fits into a shallow socket in the scapula. There is connective tissue that surrounds the joint known as the shoulder capsule. Within the joint is synovial fluid, which helps to lubricate the capsule and helps to ease movement. When Adhesive Capsulitis is present, the shoulder capsule thickens and becomes tight. Stiff bands of tissues called adhesions form and there is a lack of synovial fluid. This can lead to pain and decreased range of motion within the shoulder joint. Freezing: There is a slow progression of pain and gradual reduction in shoulder range of motion. Pain can be noticed during the day and at night and can even be noticed when the arm is at rest. Frozen: The pain begins to slowly improve but the stiffness remains. The lack of motion can make daily tasks difficult to perform. Thawing: The shoulder range of motion begins to slowly improve and the focus is on getting the shoulder back to normal or as close to normal as possible. Treatments for adhesive capsulitis include anti-inflammatory drugs (NSAIDs) or moist hot packs to help with the pain and stiffness. An Xray or MRI may be recommended to rule out other potential causes of pain. A manipulation or arthroscopic surgery may be suggested for patients who see no improvement after non-surgical measures are taken. During a manipulation, the patient is put under anesthesia and the shoulder is stretched to help break up scar tissue. An arthroscopic surgery could also be performed to cut through the tight portions of the joint capsule. Physical therapy has been proven to be one of the most effective ways to help improve frozen shoulder symptoms. Studies show that there is a 90% success rate with non-surgical treatment approaches (oral NSAIDs and Physical Therapy) for patients with frozen shoulder. The focus of physical therapy is to restore the range of motion within the shoulder joint and to help manage pain. The patient will go through gentle stretching programs and manual therapy techniques to help achieve these goals. Patients will be given home exercises and stretches to perform on their own. As symptoms improve, the patient will begin a strengthening program to help restore the strength that was lost. Adhesive capsulitis can be a very painful and limiting condition. So, don’t wait to get it checked out, for best results – the sooner you get it looked at, the better. Physical therapy has proven to be the best treatment method to help you get back to your happy lifestyle!